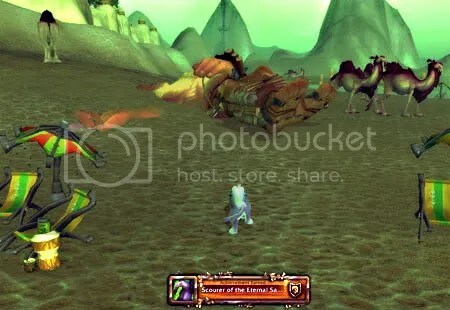 This entry was posted on June 22, 2011 at 3:54 pm and is filed under WoW Mounts with tags Feat of Strength, World of Warcraft, wow mount, WoW Title. You can follow any responses to this entry through the RSS 2.0 feed. You can leave a response, or trackback from your own site. I always try to keep my eye open for the Camel Statue. Did NPCScan go off for you when you located one? I have heard conflicting reports of NPCScan no longer able to detect the statues due to something that Blizz patched in, so any confirmation either way is appreciated. Also, it’s wrong to hoard camels. They smell bad. Let them free! Thanks! Yes, NPCScan sounded off for all the figurines but it still isn’t easy to find those tiny little things. I sure couldn’t have found them without it. Yes! 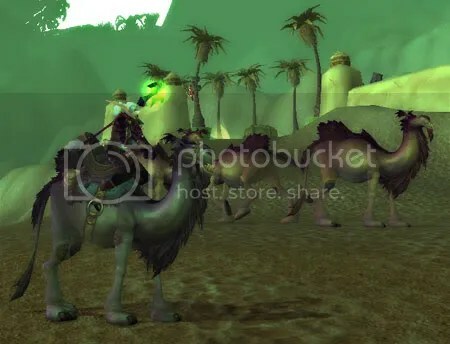 camel hoarding is just wrong, I’m glad I was able to free one. Huge grats – its obvious that these things are hard to find, so nice one! You know what it is I love about this blog? Your amazing turn of phrase. There is always that one sentence hiding there somewhere – often subtle, sometimes not – but when I find it, it never fails to make me smile, laugh and/or conjure up lovely funny pictures in my head. I love your movie, it’s running in my head now too! Oh and Döra? Can you please ask Ernee to keep us up to date on his doings? I’m afraid he’s going to be so busy killing dragons and such that he’ll forget to let us know how he’s getting on Lol. Oh Ernee will – never fear! He’s def having fun, but a bit too young yet to be killing dragons 😀 He gave Cookie a good thrashing the other night though. 🙂 Stay tuned! Holy crap, congrats! I’ve half heartedly attempted to look for those little buggers, but alas no luck as of yet. Perhaps I should go back to my early morning rare seeking *strokes chin*. Thanks! Now that I think about it I got Aeonaxx early in the morning sans contacts too so maybe there is something to looking for rares early in the day.